Methods: Students attending five different types of high schools in central Elazig (a city in Turkey) during the 2009–2010 school year constitute the study population. One class was randomly selected from each high school. Out of 650 students, 640 participated in the study. The data were evaluated by using the SPSS program; percentage, mean, and chi-square analyses were used. Findings: Of all the students, 41.7% defined the elderly as those who are 60 years of age or older. When asked the question “What does elderliness mean to you?”, the majority of the students, 27.2%, responded “peace and resting”. The second most common answer, given by 23.6% of students, was “sickness/tiredness”; 16.6% responded “wisdom/experience”. 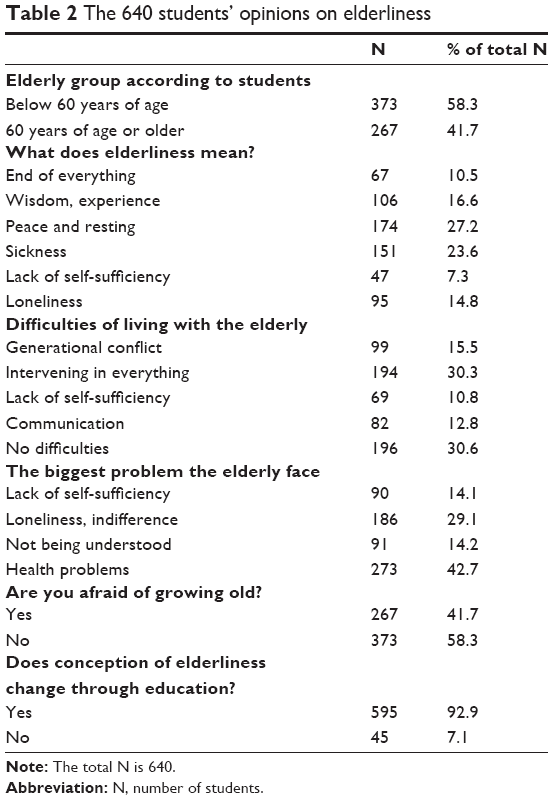 Many students (30.3%) stated that the most difficult thing about living with the elderly was their interference in everything; 30.6% of students stated that there was no difficulty at all. According to 42.7% of the students, the greatest problem that the elderly face is health. Of all of the students, 58.3% stated that they feared growing old. Conclusion: Our study has concluded the following: 1) High school students have a conventional perception of elderliness and 2) They embrace the elderly and think that perspectives on elderliness will change through education. People have different perspectives concerning aging. There are differences in perspective among various age groups and among different sociocultural and economic structures. These differences reveal the relationships between the young generation and older generations (the pediatrics–geriatrics relationship), which may cause problems such as generational conflicts. In such situations, both groups may despise each other. The youth must get to know and understand adults and the elderly as much as adults need to know and understand the youth. The aim of this study is to evaluate the perspectives on elderliness of students attending different types of high schools in central Elazig. Students attending five different types of high schools (private high schools, state high schools, science high schools, Anatolian high schools, and vocational schools of health) located in central Elazig during the 2009–2010 school year constitute the population of this study. One class was randomly selected from the first, second, third, and fourth grades of each participating high school. Out of 650 students, 640 (98.4%) participated in the study. Before conducting this study, written research permission was obtained from the Elazig Provincial Directorate of National Education, and participants provided their oral consent. A questionnaire in line with the relevant literature was developed by researchers and was administered to students under direct observation in order to collect data about their demographic features and opinions about elderliness. Regarding the questions on elderliness, the question of what the youth know about the elderly was taken into consideration. Open-ended questions were used as well as multiple choice questions so that those completing the surveys could best express their thoughts. The questions were mostly focused on the idea of the elderly and the imminent thoughts of students toward the elderly rather than direct examples of experiences with the elderly. Data gathered from this study were evaluated by using the SPSS statistics program, and a chi-square test was used to detect significant frequency distributions, medians, standard deviations, and differences between groups. P<0.05 was considered statistically significant. The study faced some limitations because conducting the study with all of the high school students in the city would be difficult in terms of time and cost. Because of this, only five different types of high schools in the city center (excluding districts and villages) were included in the study. For the study sample, one class was selected for each grade. The study was conducted with those students who agreed to participate. No exclusion criteria were defined for study participants. The age distribution of participating students was 16.51±1.11 years (minimum 14 years, maximum 20 years). 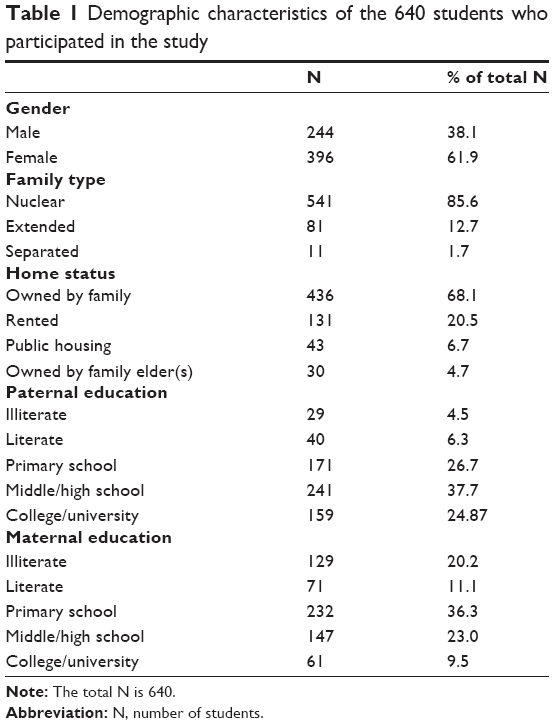 The students’ sociodemographic characteristics are seen in Table 1. Note: The total N is 640. Abbreviation: N, number of students. Of all of the students, 41.7% defined the elderly as those who are 60 years of age or older. The mean of the age at which a person was considered elderly by the students was 53.90±9.392 years. The students’ opinions about elderliness are given in Table 2. For the question, “Where should the elderly generally stay?”, the answer distribution according to high school type is provided in Table 3. Notes: *Other: state high schools, science high schools, Anatolian high school. **Percentages are with respect to the total of the line (534). χ2=10.722; standard deviation=4; P=0.03 (statistically significant at P<0.05). The percentage of those students who would want their parents to live with them was found to be 84.7% in private schools, 90.8% in vocational schools of health, and 93.8% in other types of high schools (state high schools, science high schools, Anatolian high schools). In the study, 41.7% of the participating students defined elderliness as being age 60 years or older. Students were asked at which age they thought elderliness began; the mean response was 53.90±9.392 years. This is the average for the responses, for which the range was 30–85 years. The categorization of elderliness varies with the culture of the country and with life expectancy at birth. In a study conducted in Manisa, a definition of elderliness similar to ours was found.6 Since the group participating in the study comprised adolescents, their definitions of elderliness may be extended to younger age groups. The majority of students (27.2%) stated that for them, elderliness means “peace/resting”, but 23.6% of students expressed that elderliness means “sickness”. Young people’s association of elderliness with illness may be related to their observations of the elderly around them. The proportion of those who claimed that elderliness means “wisdom/experience” was 16.6%, whereas in the study conducted in Manisa, 35% of young people stated that elderliness means “the end of everything”. The proportion who defined elderliness as “wisdom” was 12.5%.6 In almost every society, elderliness provides an elevated status for the individual. The senior citizen is an individual who is respected and has some special privileges.11 Nurses working in a nursing home in Izmir considered elderliness to be a difficult period during which constant care is needed for health and social problems.16 The reason for obtaining different results in our study may stem from interregional and sociocultural differences. Our study found that high school students generally perceive elderliness in a traditional manner, and they think that perspectives on elderliness may change through education. Necessary precautions to ease life and care for the elderly staying at home should be taken. Therefore, families should be supported and social support should be provided. The authors report no conflicts of interest in this study. Kaygusuz C, Kalkan M. [Counseling for the elderly.] Yaslilik Danismanligi. In: Ersanli K, Kalkan M, editors. [Elderliness in Rerms of Psychology, Society and the Body.] Psikolojik, Sosyal ve Bedensel Acidan Yaslilik. Ankara: Pegem Academy Publishing House; 2008. Turkish. Ornek T, Bayraktar E, Ozmen E. [Geriatric Psychiatry.] Geriatrik Psikiyatri. Bornova: Saray; 1992. Turkish. Rakicioglu N, Atilla S. [Nutrition in the Elderly.] Yaslilikta Beslenme. Technical Report. Association of Public Health Institution. 2003;8:7–8. Population Division, Department of Economic and Social Affairs. World Population Ageing 1950–2050. New York: United Nations Publications; 2001. Available from: http://www.un.org/esa/population/publications/worldageing19502050/. Accessed April 27, 2010. Turkish Republic Ministry of Health General Directorate of Basic Health Services 2002. Health of the Elderly (Yasli Sagligi): 1. Demet MM, Taşkin O, Deniz F, Karaca N, Içelli I. [Prevalence of depression symptoms in the elderly people residing in Manisa nursing homes and related risk factors.] Manisa huzurevlerinde kalan yaşlilarda depresyon belirtilerinin yayginliği ve ilişkili risk etkenleri. Türk Psikiyatri Dergisi. 2002;13(4):290–299. Turkish. Kacar G. [Life Adaptations, Tendencies, Attitudes and Behaviors of the Elderly People under Different Urban Conditions.] Yaslilarin Farkli Kentsel Kosullarda Yasam Uyumlari, Egilimleri, Tutum ve Davranislari. In: Sosyal Antropolojik Acidan Bir Degerlendirme [doctoral thesis]. Ankara: Ankara University; 2000. Kalkan O. [Elderliness.] Yaslilik [webpage on Internet]. Available from: http://www.bsm.gov.tr/makale/20011.asp?sayi=2001. Accessed April 27, 2010. Kim IK. Social support for older persons: The role of family, community and state in selected Asian countries. In: Expert Group Meeting on the Regional Preparation for the Global Review of Madrid Plan of Action on Aging; March 27–29, 2007; Bangkok, Thailand. The Elderly in Modern Society: A Cultural Psychological Reading [webpage on Internet]. Pittsburgh: Janus Head; 2007. Available from: http://www.janushead.org/JHSpg99/pope.cfm. Accessed April 27, 2010. Hegland ME, Sarraf Z, Shahbazi M. Modernization and social change: The impact on Iranian elderly social networks and care systems. Anthropology of the Middle East. 2007;2(2):55–73. The Health Statistics Almanac (Saglik istatistikleri yilligi). 2011. Available from: http://sbu.saglik.gov.tr/Ekutuphane/kitaplar/siy. Accessed April 27, 2010. Expressive Attitude: The Cowardly Elderly People [webpage on Internet]. Available from: http:/7xycorps.blogspot.com/2005/08/cowardly-elderly-people.html. Accessed July 10, 2006. Jarvik LF, Small GW. Geriatric psychiatry: overview. In: Sadock BJ, Sadock VA, eds. Kaplan and Sadock’s Comprehensive Textbook of Psychiatry. 7th ed. Philadelphia: Lippincott Williams and Wilkins; 2000:2980–2988. Özer M, Karabulut ÖÖ. [Life satisfaction in the elderly.] Yaşlilarda yaşam doyumu. Geriatri. 2003;6(2):72–74. [III National Psychiatry Nursing Congress.] III Ulusal Psikiyatri Hemsireligi Kongresi. June 4–6, 2009; Akcakoca: 125. Available from: http://www.phdernegi.org/kongre_dokumanlar/iii.uphk_ozet_kitabi.pdf. Accessed April 27, 2010. TÜRKIYE’DE TOPLUMDA YAŞLI INSANLARIN YERI [COMMUNITY IN THE ELDERLY PEOPLE ‘S PLACE IN TURKEY]. Available from http://www.tuyev.org.tr/haberler/index.php?haber_id=6. Accessed April 27, 2010. Bekaroğlu, Mehmet. [The reality of nuclear family and elderliness.] Çekirdek Aile Gerçeği ve Yaşlilik. [Proceedings of the 1st Family Council.] Aile Şurasi Bildirileri, Başbakanlik Aile Araştirma Kurumu Yayinlari, Ankara: Prime Ministry Institution for Family Research Publications; 1990:279–284. Subasi N, Oztek Z. Some Opinions of the Elderly Living in Cankaya on Elderly Care (Cankaya Ilcesinde Yasayan Yaslilarin Yasli Bakimi Konusundaki Bazi Dusunceleri). 2004. Available from: http://www.dicle.edu.tr/~halks/yedi%205.html. Accessed April 2005. Baran AG, Kalinkara V, Aral N. [Elderly and family relations: the case of Ankara.] Yaşli ve Aile Ilişkileri-Ankara Örneği. Ankara: TC Başbakanlik Aile ve Sosyal Araştirmalar Genel Müdürlüğü. 2005;(127).